It doesnt matter if you are a Twin or not, or not aware of it yet. Relax and enjoy this union /marriage within you, become one and feel the love of home, for you to move into your souls mission. 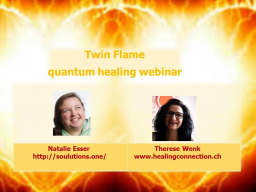 Listen to the replay of this webinar as many times as you wish to connect with these healing energies. If youd like to have a private one to one session, we are happy to assist you.